Before I begin the Tool Time, I want to thank everyone for all your comments about my new sewing room. Wow, that was a lot of blogging love coming my way...there were 100 comments!! There were some questions about different things, so I'll do a post and answer them all in one. Today's Tool Time is a quick tip, but one of my absolute must haves in the house. They are Command's 3M removable strips and hooks. I know you have probably seen these on TV, but they really do work. 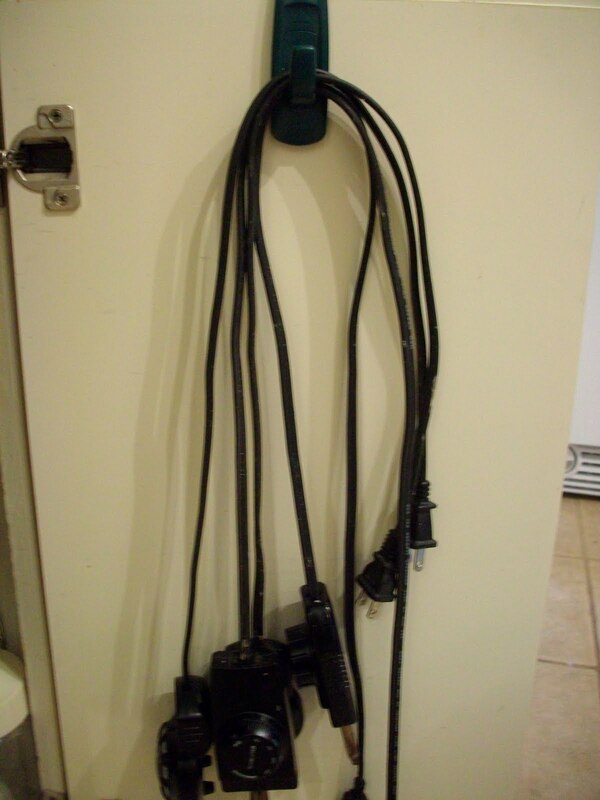 The hooks come in different sizes and can be used for anything. 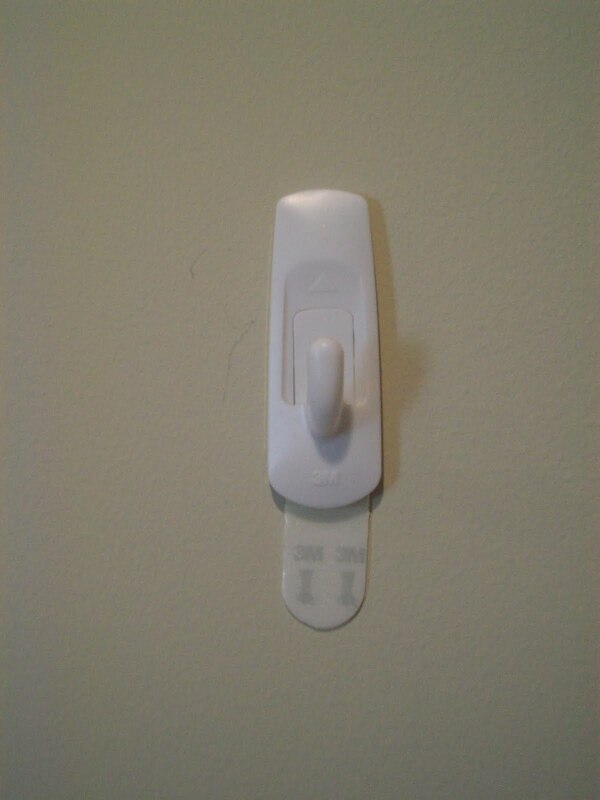 They mount to just about any surface and really remove without harming the wall, paint or wood. The tip with removing it, is to pull the tab straight down close to the wall. It stretches as it comes off without any damage. Here is a small sample of some that I have. I use them in a small cabinet in our bathroom. The cabinet stores supplies and all my jewelry. On the inside of the door was wasted space, so I used the hooks to hang all my necklaces. Here is one on our front door which is metal. There is one issue with this...it will pop off in extreme temps in the winter. 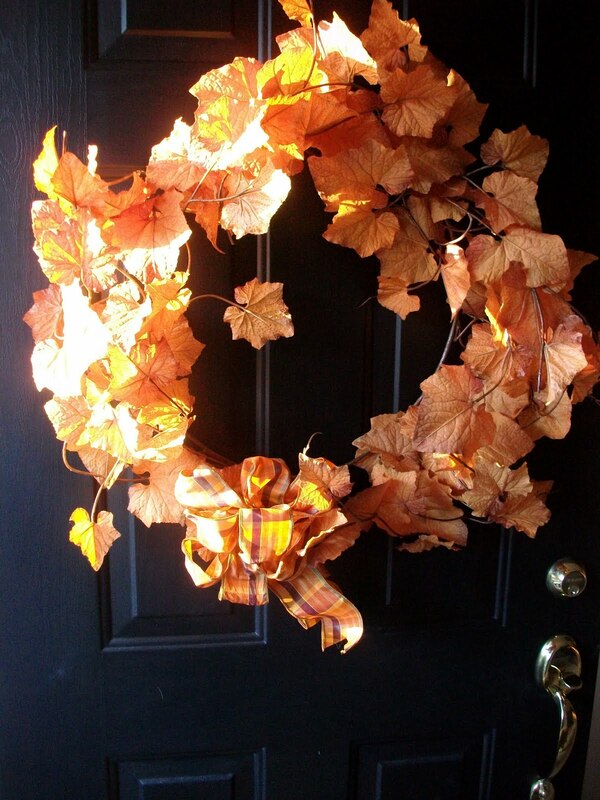 Great to hang your favorite wreath. This is what the hook looks like. You will have to apply the sticker to the hook. One side says "wall" and the other is applied to the hook. See the black arrows on the bottom tab...that's where you pull it straight down to remove. I used these hooks to hang two wreaths over our bed. I move furniture so much, I would have holes in the walls everywhere if I didn't use these. You can't tell where this one is, but it's on the top of our fireplace mantel. 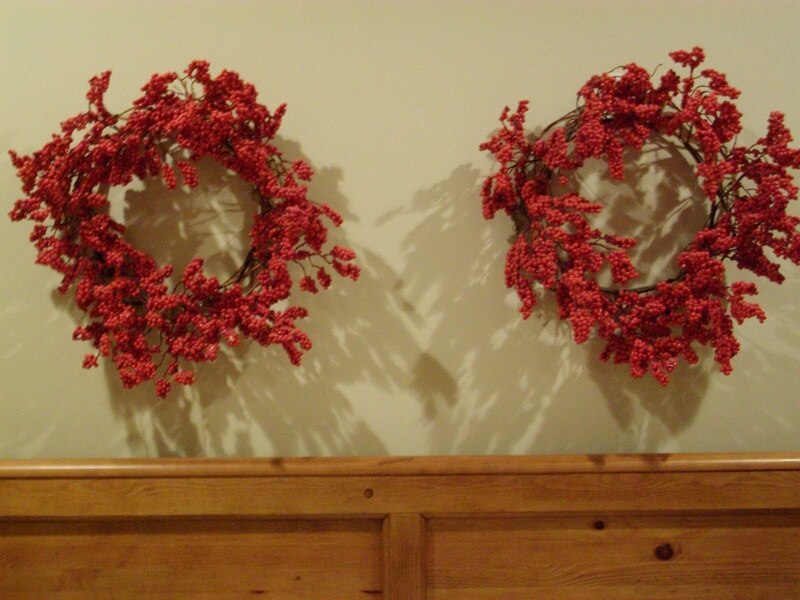 I leave them up all year, because you can't really see them. They work great for hanging the evergreen garland at Christmas! They also stick to glass. Oh, look another wreath. I think I have a problem. These are the covered cork boards in my sewing room. See the little tabs sticking out of the corners of the black one. I used the poster stickers for these. No hooks needed, you just stick them to the item and then to the wall. I never use the stickers that come with the cork squares. They will ruin the wall. This one is a large hook I have mounted to the inside cabinet door of my pots and pans. This holds the cords to electric skillets. This one holds little flashlights. You know when your family isn't feeling well and they want you to check their throat. Well, hang this next to the medicine cabinet, so you always have one on hand. and this is a decorative wall art that may change with the wind, so sticker hooks are better than nails. This was a quick tip, but one you can use in a million ways. For quilting you could sew little rings to the back corners of the quilt and then hang it from the hooks. Make sure the hooks are below the quilt edge so you can't see them. Just think...quilts everywhere and no nails. 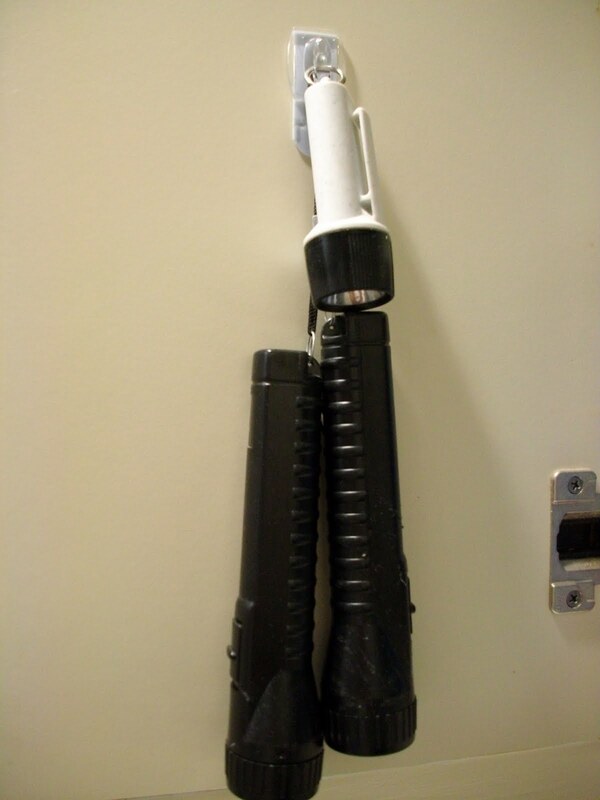 The hooks are labeled with the weight that it can hold, so make sure you use the right size. ps...I have no affiliation with this company, I just love them! I love these little things, too! You can also use them to support a dowel rod in the pocket behind a quilt which makes moving quilts around walls so much easier. I like the flat picture ones also. I used them to hang wine label plaques on back splash in my kitchen and those plaques are heavy! Works like a charm. oh I am going to have to run out and buy a bunch of these. 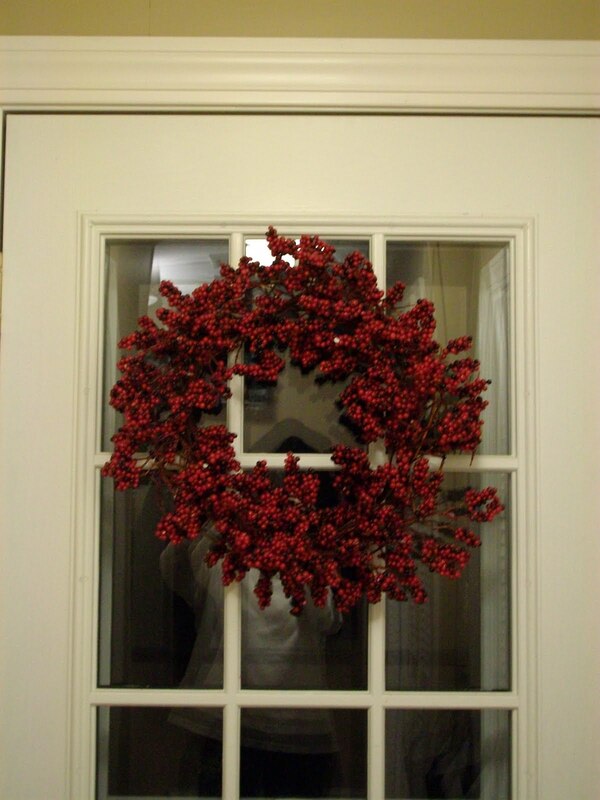 LOVE that red wreath on the door, did you make it???? ok, had to laugh when i read you move your furniture around so much ! I am ready to redecorate our home and yes there will be lots of furniture moving! I need some of these. Where do you buy them? I've used them to hang small quilts too. I really don't like making holes in the walls. I like the idea of inside the cupboards, I'm needing that tip. Thank you for all the ideas. 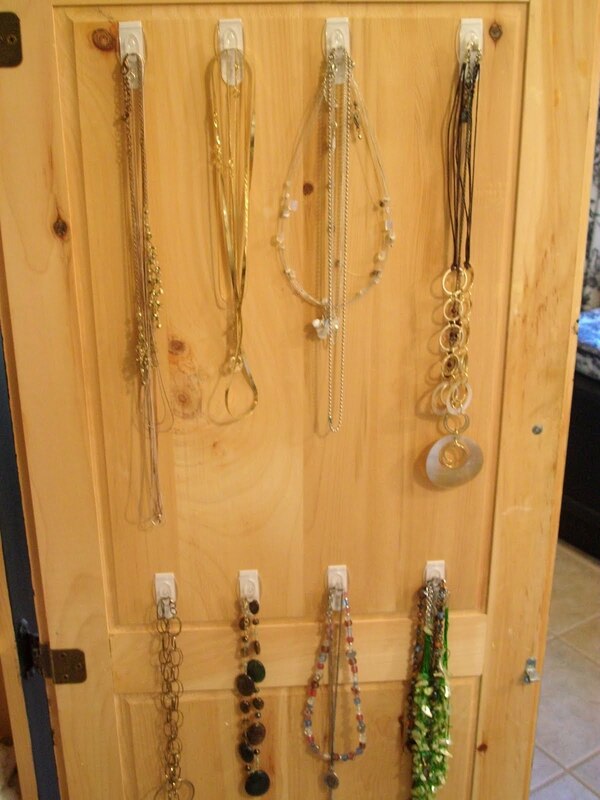 I'm liking the idea of how you hung your necklaces...might have to steal that idea for myself! I've been tempted by these little hooks, but didn't think they would really work. So glad to hear someoneo other than the advertiser say that they do. I'm going to get some when I'm out today. What I couldn't make up, can you remove the sticking part easy when you don't want the hook on that place any more... Besides... why do I feel jealous when I see your beautiful new sewing room even though I have my own ;-)? 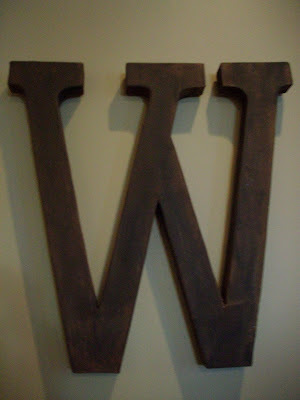 There are also heavier ones that are for hanging pictures. They have a velcro type thing. 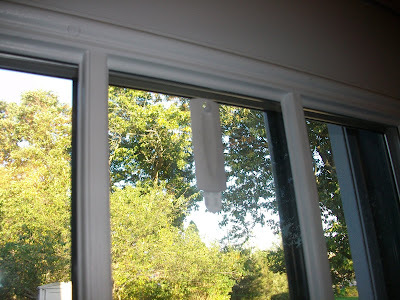 I used them to hang a small quilt on the side on my kitchen cabinet which is next to my computer desk. I use these all the time. Didn't know you could use them on glass though. I use these too. Only during the holidays to hang our Christmas stockings but they DO work. I must have lost my last post somewhere. So you live near a Tim Horton's? When I saw that box (I am keeping them from now on) I thought that you were Canadian...our favorite coffee shop. Thanks for all the reminders, I find that I must go back and see them all from time to time as I forget how many ideas you have. 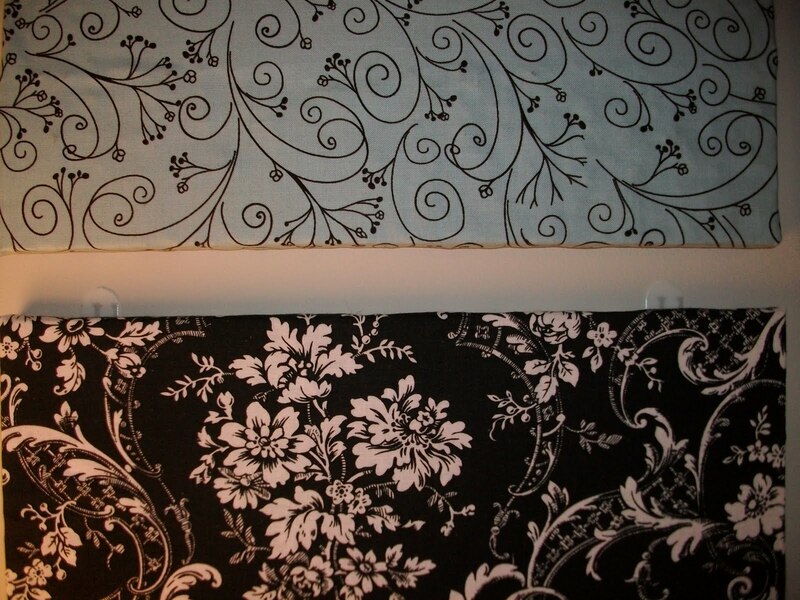 your sewing room is awesome...black is one of my favorite colours for any decor. I love these too. 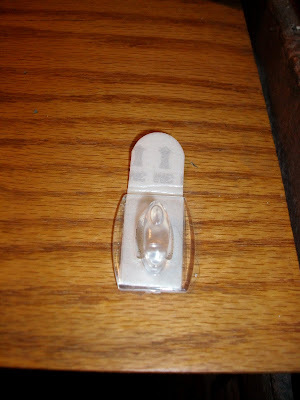 They also have clips besides hooks and I use these for hanging quilts. And my pattern instructions while I'm working on them to keep them in sight and off the table. I'd never heard of these before! Thanks for posting about it - I'm definitely going to check them out now. backsplash.It must be too slick. buy more and try again. mine and now I can't find anything. We love those at my house as well! I am glad you got set up at the new sewing room! I am reorganizing my sewing room too!I can't wait to be done so I can ENJOY IT! I have them all over our camper. Since it's tight, these are great for extra storage. 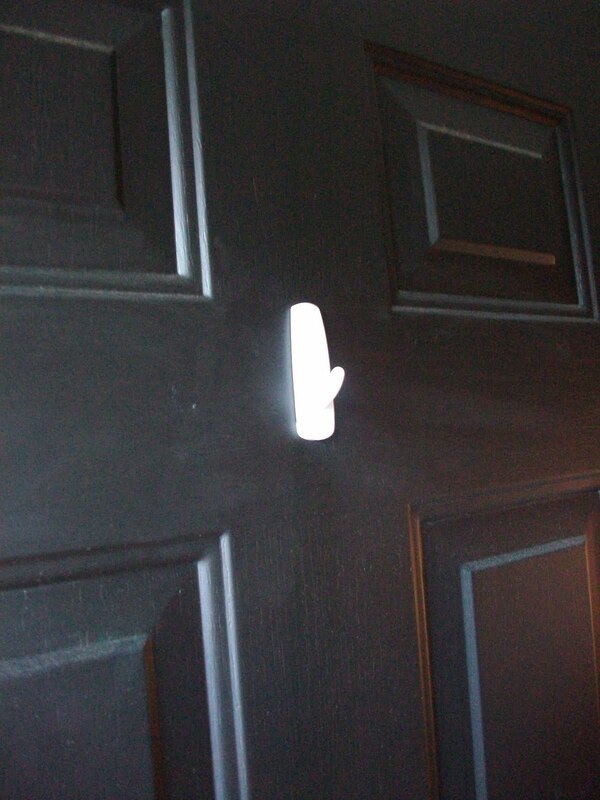 Great for people who are renting and are not allowed to put holes on the walls. Well, once again you have shown me something that I have never used. I have seen them on TV but never tried them. I think I will just spend Black Friday at Lowes and Home Depot. I had seen the advertisements and wondered if these would work. Looks like they work just fine, so I am going to check out where I can find them locally and give them a go. Thanks for telling us about them. 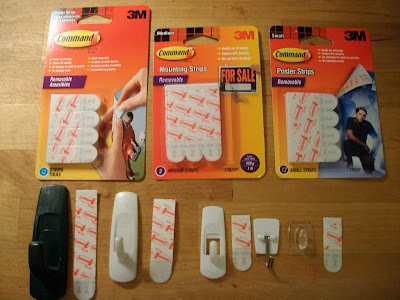 I've seen the hooks, but didn't realize that there are replacement tabs or that you could use them without the hooks. I am in the process of reorganizing, so things are moving and I'll try these. As above - it's nice to have a testimonial from someone other than the advertiser! I love your Tool Time Tuesdays - thanks for sharing your creativity. I just discovered your blog and it is wonderful. Your Tool Time Tuesdays are brilliant! I am also a gadget organizational junkie. I am a native New Englander, too, maybe that has something to do with it. 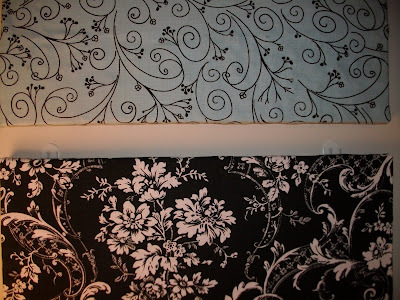 Your sewing room is great and I got some great ideas to use. Thank you for sharing. Looking forward to visiting often. Anything else? To heck with Christmas shopping I'm on a mission. I love all your tips . . . but my main reason for commenting is to let you know that I received my "I Spy" fabric package in the mail last week -- yea! Thanks! P.S. LOVE your new sewing room!!! It's beautiful, and almost worth having a flood! I also think these things are great. I used two large ones to mount my husbands favorite autographed hockey stick. I love these on the side of my cutting table (old dresser rehabbed)to hold all the rulers for Rotary Cutters. Use the little ones with the metal flipping hook! And on the inside of the broom closet to hold all the little things like window washers and tiny wool dusters. I love these, too. I carry them with me when we travel, especially to the beach. There are never enough towel rods for all those beach towels. So we use these to hang towels on and then safely remove the hooks when we leave. These hooks are the best invention since sliced bread! I have them all over my quilt room holding up my rulers, scissors, cutting mats, etc. I shudder to think of all the holes that would be in those walls if I had used nails! I'm still trying to figure out how to use them to hang wall quilts . . . I love these, too. My hubs used to get upset about all the holes I put in the walls. I have found out that one of the secrets of a clean removal, is to firmly push the top of the hook against the wall, while you pull down on the tab. Then the tap pops off cleanly, without removing any paint. Ask me how I know! I am so happy to hear a decent review. I appreciate you doing this. Your website is terrific. Thanks!